Kenwood Plc offer a comprehensive range of woodworm treatment services. We do not normally charge to inspect the property in most parts of London and to provide a report / quotation. Kenwood Plc have published a handbook “The Guide to the Identification of Insect Infestation and Fungal Decay” which is an authoritative guide used by Chartered Building Surveyors, Valuers and Home Inspectors, undertaking property inspections. 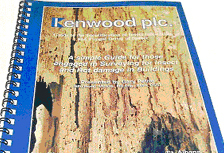 Kenwood Plc’s range of timber treatment services, includes effective measures for the control of all commonly found wood boring beetles and can be used to control existing infestations and prevent further attack. Where woodworm treatment is required, our product range includes water based, low odour preservatives which in many instances, require properties to be vacated for only short periods of time. Full details are provided for each specific project, following a site inspection and risk assessment by our Surveyor. 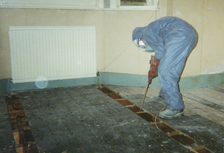 The most common method used by Kenwood Plc for woodworm treatment to timber floors, involves exposing the timbers by lifting floorboards in a parallel manner to gain access to the sub floor void. 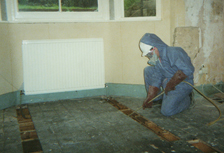 The joists, wall plates, bearers, sub floor timbers and the underside of the floorboards are then treated using Kenwood insecticidal timber preservative. Kenwood Insecticide is specially formulated for deep penetration into the timbers, in order to ensure eradication of existing woodworm infestations and future protection of the timbers. Treatments are completed by our own skilled operatives and most woodworm treatments are completed within one day. Our woodworm products have been granted a one hour re-entry status, therefore the treated property can be re-occupied once the timbers are dry (minimum of one hour afterwards). Attacks sapwood of softwoods and hardwoods. Infestations appear as round holes approximately 2mm in diameter. Sound timbers can be effectively treated using Kenwood insecticide, which eradicates existing infestations and provides future protection to the timbers. 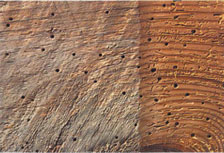 Superficially looks similar to Common furniture beetle, with holes approximately 2mm, but only attacks the sapwood of wide-pored hardwoods such as oak, elm and obeche. Normally only found in items of recently imported hardwoods. 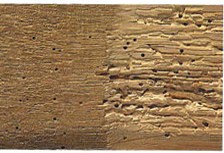 Often found in plywood where the obeche core is attacked. 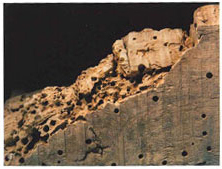 Damage looks like large furniture beetle, with holes around 3mm, often with extensive tunnelling. Can create significant damage. 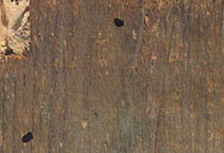 Affected timbers are virtually always hardwoods, with some decay, commonly affecting oak. Deathwatch beetle will also attack softwoods if in contact with hardwood. Embedded timbers are particularly susceptible. Periodic re-treatment may be required due to large dimension timbers and some timber replacement is often required. House Longhorn Beetle is a significant pest and attacks the sapwood of softwoods, especially within roof voids and loft areas. 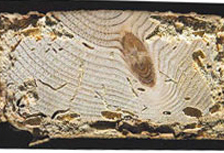 Tunnelling can cause significant internal damage to timber, when extensive tunnelling action of larvae can cause complete disintegration of sapwood, whilst leaving a thin outer surface of timber. This type of infestation often results in the need for replacement of affected timbers. Infestation is identified by appearance of large (6-8mm) truly ‘oval’ holes, sometimes with ragged edges. Treatment of active infestations is applied by means of a deep penetration preservative paste which provides deep penetration into the timber members to effectively control and eradicate beetle attack. This type of infestation is limited to regional areas, predominantly in the South West of London and Surrey, although may be found elsewhere is lesser numbers. Kenwood Plc carry out a wide range of treatments for the eradication and control of all commonly found wood boring insects. Following inspection by our Surveyor, we will provide a report of our findings and a quotation for treatments if found necessary. Our timber treatments are guaranteed for up to 20 years, depending on the type of infestation and the proposed treatments. Full details of the guarantees available will be provided with the report following the inspection and assessment. To arrange an inspection, please ‘book a survey’ online or call a member of our team to discuss your requirements.